If you have been at the Radboud University in Nijmegen lately – you might have seen this ad (PDF). 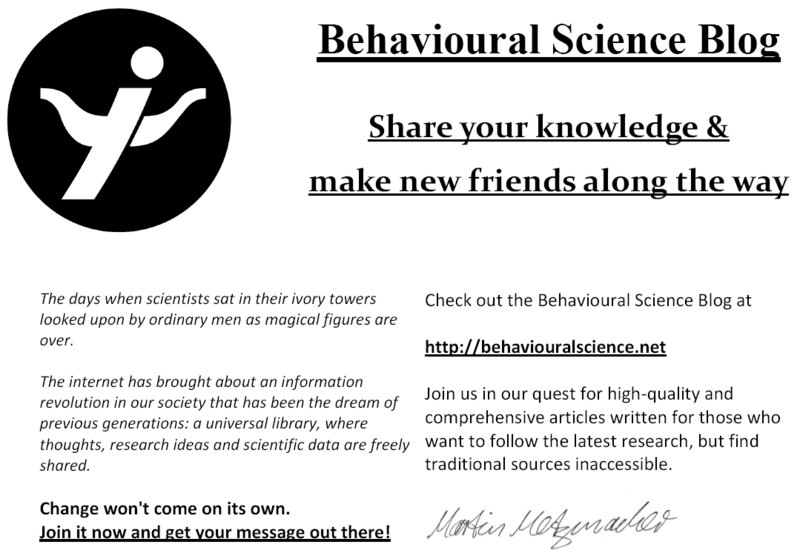 The Behavioural Science Blog is looking for new authors. Lots of them! Writing this blog (together with Christina now for some times) has been one of the most interesting and also rewarding steps I have taken in my academical carrier. Behavioural Science is often characterized by ground breaking, but very low-level research. Oftentimes it is only a very select group that actually read the article and often projects get abandoned, because the end goal “scientific article” is so far away. I also wonder sometimes why we, as scientists, still use this very complicated system of scientific journals. Okay let’s be honest. Peer reviewed journals are very important when it comes to select high quality research – that’s for sure. But what is with all those really good, but not perferct research? And what is about those great ideas that you have, but never act upon? As we enter the digital age this will all change – communication will be open, instead of closed. Ideas will spread fast, instead of slow and (from my perspective the best improvement) “ordinary” people will have access to scientific data and ideas. However the language suited for writing for a select group of knowledgable people is different from the style when writing for “normal” people. It’s all about “What does that tell us?”, “WOW” and “Oh yes…I can use this piece of information for doing X!”. Join us in our quest for high-quality and comprehensive articles written for those who want to follow the latest research, but find traditional sources inaccessible. Change won’t come on its own. Join it now and get your message out there! If you want to become a part of this blog just send me an email and tell me a little bit about who you are and what you would like to write about. Videos, pictures, articles – it’s all welcome. The only thing I ask from you is that it comes in a format that makes it comprehensive to a large group of people, not only scientists in the field of behavioural science. This has been a great journey for me and I enjoyed every bit of it. I hope you will enjoy it, too! I started this blog about two years ago, on September 27th, 2009 with the article Why Evolutionary Psychology is a Valid Approach for Studying Human Behaviour. Since then the blog has grown to 45 postings, which are mostly text-based (and relatively long). The stats show 14,241 hits in total, and if I look at the stats there seem to be about 40 visitors per day now (however there are quite huge fluctuations). Ever since I have reached (within a few month) Page Rank 4 I have been hanging around at 2nd position in Google for the search term “Behavioural Science”. To my big surprise I managed to beat the Journal of Behavioural Science, Master of Behavioural Science, you name it – I outrank it. Only Wikipedia will be 1rst winner forever (I guess). A few month ago the requests for guest posts started rolling in. I now get one or two offers a week and they have mostly been disappointing. It has been a lot of fun observing what people would like me to post in order to get a link back to “their” site (which is mostly full of boring affiliate links). The one I liked the most was starting with “Behavioural Psychoanalysis is the Science of…” – I did not read on. My girlfriend had to sooth my pain after I fell of the chair laughing. Marvellous! However there have also been very interesting discussions with people I admire. Tom, Andrew, Henrik,the people from the Linked-in group, facebook, twitter (just to name a few) – thank you for your input and your motivation. It has been a joy to publish your ideas. I am still looking for good ideas and interesting networks. If you come across one, please post a link or write me an email. My plan for the future is to recruit more Behavioural-Science-Geeks like me. It would be awesome if we could have a broader perspective on this blog. Just to inspire you: My text were not all thought through very well – it does not have to be 100% prefect. I know that scientists have some obsessive-compulsive thing going on that they only want the world to see articles that are ready to be published. Forget it – the new times ask for new behaviour. You need to open-source and share your ideas if you want ot be successful in Science 2.0. I would like to say THANK YOU to everyone that has contributed to the success of the blog, by reading, commenting, writing or just by suggesting a topic. If you like what you read – get involved – leave a comment – introduce yourself!